Kenya is home to Africa’s second highest mountain and an array of national parks and reserves creating an abundance of wildlife and nature experiences for the nature enthusiasts. It is not hard to discover and explore natural wonders in this amazing country. Kenya is a country that is the epitome of the “African” experience that most people are looking for when considering coming to the continent. The nature attractions that Kenya offers visitors are hard to top. A visit to Kenya also lets you experience one of the most exciting features of the 7 Natural Wonders of Africa. Put Kenya on your travel bucket list and read on below to know why. The Serengeti Migration is one of the highlight nature attractions in all of Africa. 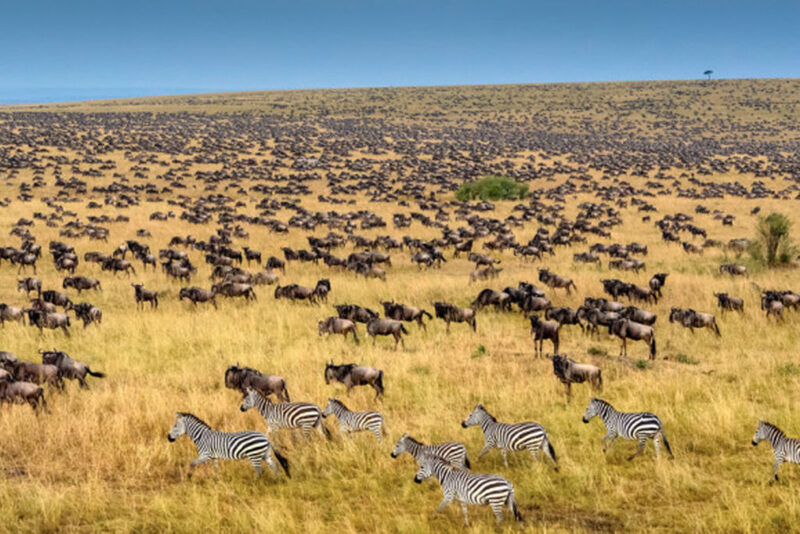 Although there are other animals the majority of the Serengeti Migration is accounted for by the approximately 1.6 million wildebeests, 470,000 gazelles, and over 250,000 zebras. Collectively, it is the largest terrestrial mammal migration in the world. 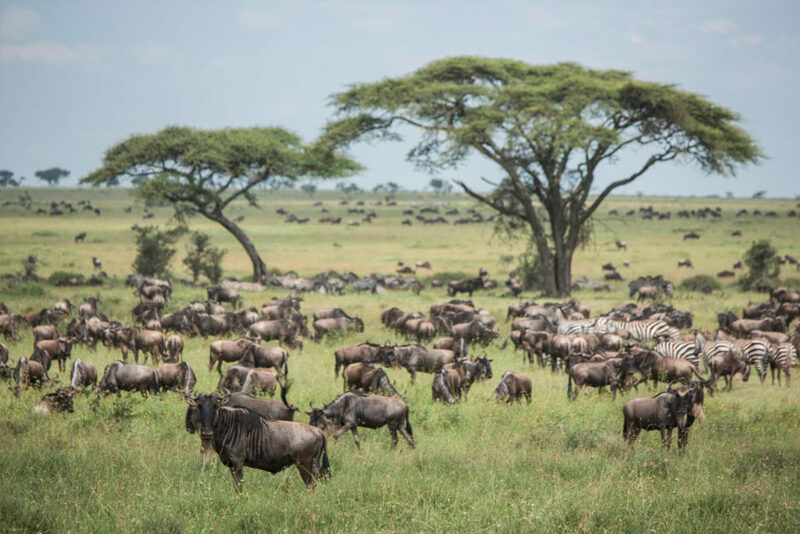 The majority of the Serengeti Migration occurs in Tanzania, but Kenya has its fair share and welcomes the most exciting part of the migration with the crossing of the Mara River into Kenya. This is a targeted attraction and destination for nature enthusiast who want to witness nature at its fullest. The Serengeti Migration It is both the largest and the longest migration in the world. At the Mara River everything gets real as wildebeest and zebra continue to battle lions, leopards and exhaustion, and now they add in the challenge of cross the river without succumbing to waiting crocodiles. The Serengeti name translates locally to “endless plains.” The Kenya and Tanzania governments work together to establish protected lands for 80% of the Serengeti plains and migration area. 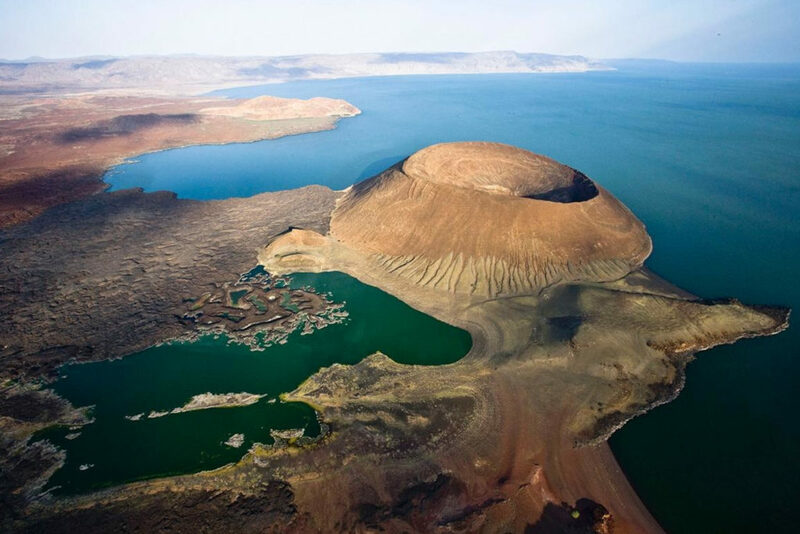 Lake Turkana is the world’s largest permanent desert lake, the world’s largest alkaline lake, and based on volume the world’s fourth largest salt lake. Accordingly, it is one of Kenya’s natural wonders. The Lake Turkana catchment encompasses an area of 50,530 square miles (130,860 sq. km). The length measures 180 miles (290 km) with the width at 20 miles (32 km) creating a surface area of 2,473 square miles (6,405 sq. km). Lake Turkana is notorious for its abundance of Nile crocodiles, which may be the largest in Africa. Other wildlife includes black rhino, elephant, cheetah, oryx, zebra, topi, giraffe, and gazelle. There is also a large population of water turtles with the Turkana mud turtle being endemic to the lake. The Maasai Mara is a Kenyan attraction and wonder on its own, but it is a destination that also allows you to experience one of Africa’s 7 Natural Wonders of the World as the Serengeti Migration crosses the Mara River into the Maasai Mara national park. The Maasai Mara expands across 580 square miles (1,510 sq. km) of Kenyan wilderness that includes forests, scrub, savanna, and cloud shadows. It is globally recognized as a destination rich in wildlife spotting opportunities for seeing lions, leopards, and cheetahs. The migration of wildebeest, topi, zebra and Thomson’s gazelle into the Maasai Mara occurs in mid-September through mid-October. Because it’s wildlife, you can’t bank on that timeframe with the migration across the Mara happening as early as July and even into November. It is all driven by the rains. The Maasai Mara is home to lion, leopard, elephant, buffalo, rhino, crocodile, and hippo meaning the entire Africa’s Big 7 can be experienced. Some of the other wildlife includes: cheetah, jackal, hyena, bat-eared fox, impalas, giraffe, roan antelope, and hartebeest. Mount Kenya is the second highest mountain in Africa, and it serves as the iconic attraction and the source the country is named after. It is located about 93 miles north-northeast of Nairobi making it one of the popular attractions for travelers to Kenya with 16,000 visitors exploring it every year. Mount Kenya is a stratovolcano that reaches a summit of 17,057 feet (5,199 m). An area of 276 square miles (715 sq. km) around the mountain has been declared a national park. The lowest moraine is found at 10,800 feet (3,300 m). 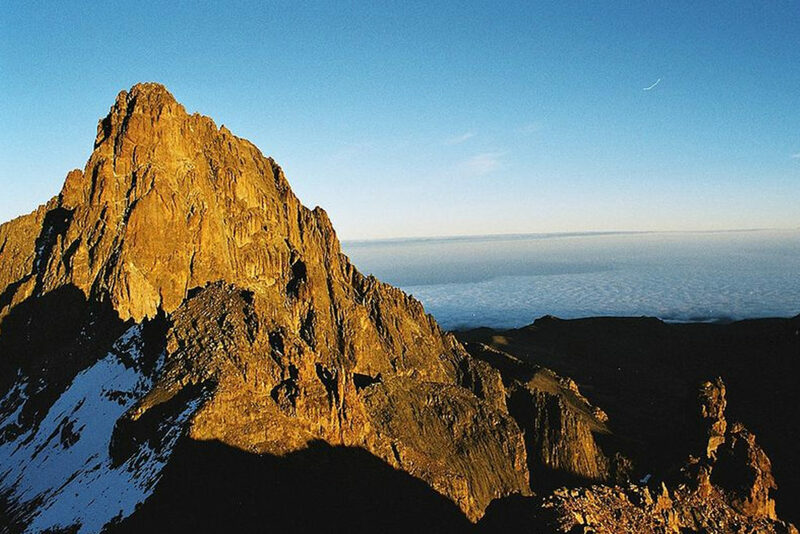 Mount Kenya is comprised of basalts, rhomb porphyrites, phonolites, kenytes, and trachytes. The highest peak is Batian with Nelion occurring not much lower at 17,021 feet (5,188 m). There are 16 different peaks atop of Mount Kenya.